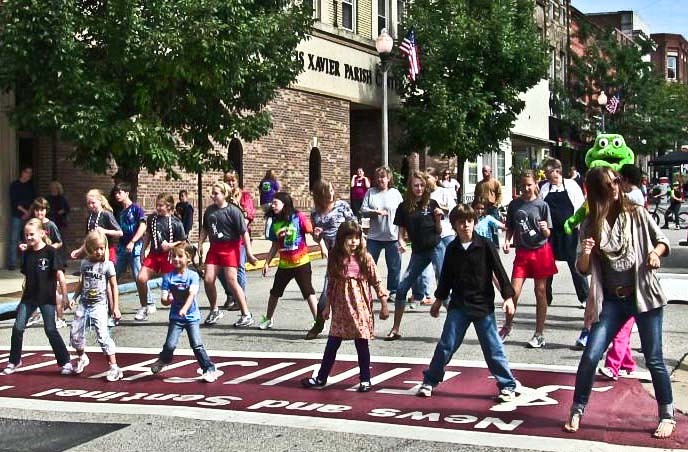 On Park Day, Parkersburg closes down some streets and creates a physical activity festival that connects people to their running, walking and paddling clubs, among other things. It was so popular, they now do a mini-version every month. (Photo courtesy The OPAM). This is a smorgasbord of do-able, practical ideas that can help us turn our dreams of a healthier community into reality. West Virginia is at or near the top of every awful chronic disease list. It doesn’t have to stay that way. In 2012, West Virginia University researchers found that one in five West Virginia fifth graders already had high blood pressure. One in four had abnormal cholesterol levels. One in five kindergartners were coming to school obese. Almost one in three adults were obese. We know we can change that. Doctors agree that two main things lower children’s risk of future chronic disease: daily physical activity and healthier diet. This site is full of ways you can promote both. A healthy community is like a jigsaw puzzle, made of many pieces. We have gathered some of the best pieces into a ‘Try This’ puzzle that will help you plan your own efforts. * Look at them all, a few at a time. * Decide which might work in your community. * See which you’re already doing. * Bring people together from many parts of your community to help. * Choose some projects and get started. They’ll add up! This site was created for the children and families of West Virginia by Kate Long under grants from the Claude Worthington Benedum Foundation and KEYS 4HealthyKids to the West Virginia Healthy Kids and Families Coalition. Adam Flack supplied the technical expertise that brought the site together.